There's a lot of value in Wynn Resorts' real estate. One of the trends sweeping through the gaming industry over the past decade is selling real estate to real estate investment trusts (REITs). Sometimes companies control their REITs, like MGM Resorts (NYSE:MGM) does with MGM Growth Properties (NYSE:MGP) and Caesars Entertainment (NASDAQ:CZR) does with VIVI Properties (NYSE:VICI), and sometimes real estate is sold to third-party companies. REITs free up cash for casino companies, often to the tune of billions of dollars. That money can help reduce debt or fund growth projects, which is attractive because it doesn't fundamentally change a resort's operations. But Wynn Resorts (NASDAQ:WYNN) has avoided the temptation to sell most of its real estate over the years. If it did, however, the company could free up billions of dollars in cash. The first thing I want to highlight is the scale of gaming REITs. You can see below that MGM Growth Properties, Gaming and Leisure Properties, and VICI Properties are now massive organizations with large enterprise values. 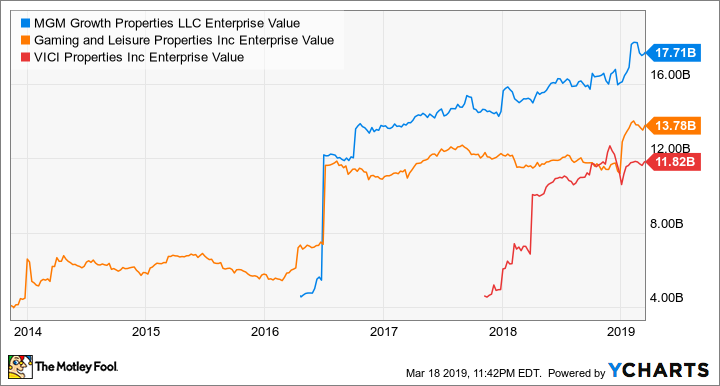 You can think of that enterprise value as the amount of value that was split off from gaming companies and put in the REIT. MGP Enterprise Value data by YCharts. These subsidiaries are often consolidated onto a gaming company's balance sheet, so they don't really look like they're reducing debt on the surface. Another option besides a subsidiary REIT is to sell a minority stake in portions of real estate to a REIT. In 2016, Wynn Resorts sold a 49.9% stake in the malls in Wynn Las Vegas to Crown Acquisitions for $472 million in cash. Wynn still controls the assets, but some of the cash flow from properties will now go to Crown Acquisitions. Wynn could find that appealing to operations in the long term. Check out the latest earnings call transcript for Wynn. It's easy to see why Wynn Resorts would want to consider selling some of its real estate. 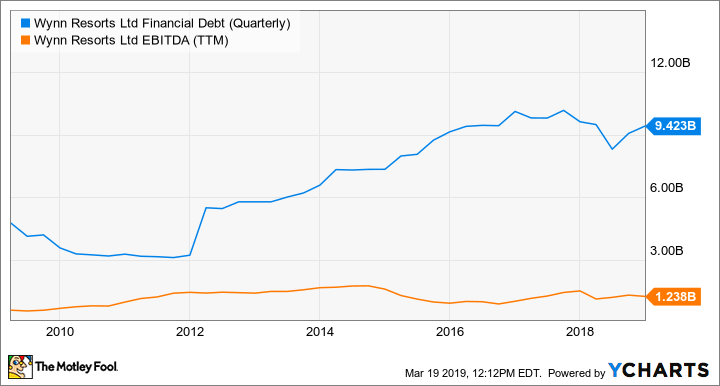 The company's debt load has ballooned to nearly $10 billion -- a lot of leverage for a company that generated $1.23 billion of EBITDA last year. Selling real estate would bring a big infusion of cash, which could be used to reduce debt. WYNN Financial Debt (Quarterly) data by YCharts. As attractive as it may be to sell real estate, there are reasons Wynn Resorts isn't doing so just yet. With the Wynn Las Vegas hotels, a convention center being built in Las Vegas, and upcoming Encore Boston Harbor, it's conceivable that Wynn Resorts has between $5 billion and $10 billion of real estate assets it could sell to a REIT. But it's maintaining most of those assets on the balance sheet because it wants control of its properties. Even though REITs and gaming companies often work hand in hand, if changes need to be made, there's another layer of decision makers to get through. Wynn Resorts can do what it feels is best for its properties without any of that red tape. Steve Wynn valued that control, and for now, the new management team does, too. When looking at a stock like Wynn Resorts, it's important to consider the assets underlying the business on top of evaluating the business itself. The company controls valuable real estate in Las Vegas and Boston that could eventually be monetized to increase shareholder value. That's a valuable card to hold in a gaming industry that's seen its share of ups and downs over the years.